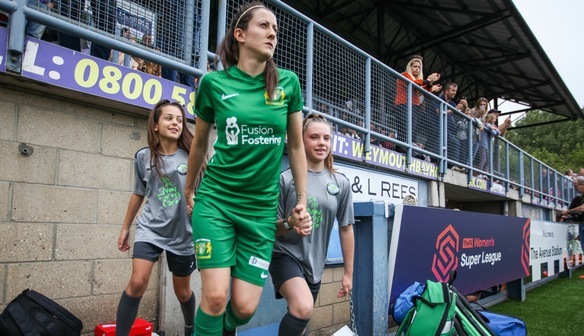 Just days after announcing the Kids For A Quid initiative for Yeovil Town Ladies' match against Everton Ladies, the club is delighted to be able to announce a further ticket offer. Half price tickets for adults will be available to purchase for all fans who buy in advance, up until midday on Friday 2nd November. THIS OFFER HAS NOW EXPIRED. With the Glovers travelling to Brighton this Sunday - who sit just one point ahead in the league - and then facing Everton at Dorchester Town - who sit just two points ahead in the league - these two matches are crucial and the ladies need all the support as they look to propel themselves up the Women's Super League. Fans can enjoy 50 per cent off the already discounted online price of £5, by following this link. Having already welcomed 1100 fans to the Clayson Stadium when Arsenal visited last month, the players would love to experience a similar atmosphere to get them over the line and towards a positive end to this opening part of the seasons. Captain Megan Walsh said: "I would like to say a big thank you to all our fans for the support you have already given us this season. To have already played a game where more than 1000 fans turned up, is really special and it is fantastic to see the fan base we have already secured here at Dorchester Town. "We are already looking forward to the Everton match and we love meeting everyone after the game." With the season now well underway, and the winter break not too far away, this match could be defining in Yeovil Town Ladies's season. So, don't miss out with just a week of this discount to enjoy. We look forward to welcoming you to The Clayson Stadium on November 4th.